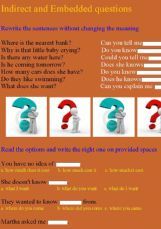 Indirect- Embedded questions for ss to practise some common mistakes done when speaking... Hope you find it useful and enjoy it! beautiful!!! 3 thanks for sharing!